Preface: before this stroll down the corridor, I had been sitting comfortably in an empty cabin with my travel mates Becky, Sam, Dana, and Paul as our train rocks merrily along. We were probably playing poker and betting with the bag of lychees we’d earlier randomly received. The train had come to a halt at it’s next station and new passengers were boarding. We were about 4 hours from our destination. There were too many of us to all fit in a private cabin, so we’d been paired off into separate cabins, with Paul being the brave one by taking the lone bed in one of the cabins. 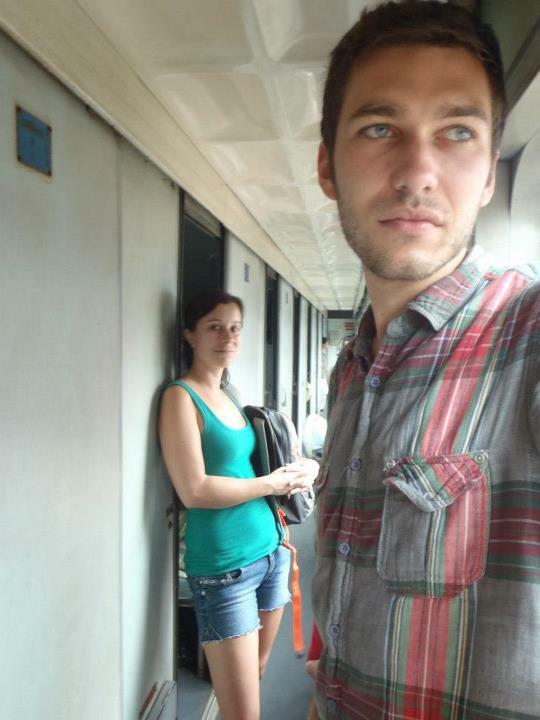 This was a 20 hour train ride, so as the train hauled along, more and more passengers exited. Finally, one of our shared cabins had emptied, so we’d quickly occupied it with ourselves and games to pass the time. As I said before, the train had come to a halt at a station. We were all enjoying our privacy when a mom, with two shy trailing children opened the compartment door, it seemed they had reserved a bed in this cabin. To make matters more interesting, shortly thereafter, a Vietnamese grandmother came bustling in with two more children. She began to make a fuss at us in Vietnamese. Could it be that we were sitting on her bed? Was it that we were staring with our mouths open? Maybe it was the gambling? I’m not sure. All I knew was: angry Vietnamese grandmas are a sight to behold. I bolted out of the room to the safety of the hallway. I waited a few moments for the train to start moving again, which is when I began to walk. Calling the train grimy would be a kindness. I can’t tell the original color of most of the interior, and the windows are opaque or broken in most places. As I walk down the hall, the midday sun flickering on the floor, I notice just how incredibly warm it’s become. Mine and Becky’s room is sealed like a tomb. The bunk under Becky currently has a sleeping pregnant woman who, by the look of her, could very well give birth on the train. Her assumed father is sitting on a tiny plastic stool in the hall in an attempt to give her space. We’ve been following his example by avoiding going in our compartment at all costs. As I walk past, dad eyes me suspiciously, but I note that it remains closed to the world. I don’t have to speak Vietnamese to know that he thinks we shouldn’t go in, for our own safety. Station attendants and passengers yell loudly to one another as they squeeze past me in this tiny hall. There is a young boy at the end of the corridor wearing red shorts, taking long drags on a cigarette. The next compartment is Sam and Dana, the room we had just barely escaped from. As I make my way past, I see Sam and Dana hanging from their upper bunks, looking at me with an expression that clearly states “We have no f***ing clue what is happening right now! Save us!” I look from their bewildered faces down to the lower level of the compartment where it seems the Vietnamese family has already made themselves at home with a huge lunch set out and several of the children crying. Mom and grandma arguing, most likely over who forgot to pack milk. I look back at Sam and Dana one last time, mustering the only answer I can think of: a look of sympathy. This compartment scares me, so I keep inching down the crowded hallway to check on Paul. I peer into his room and notice a completely opposite atmosphere from the previous room. It’s very quiet and three Vietnamese are crowded attentively around Paul. Everyone is fascinated with the notebook in Paul’s hand. I can only imagine what is happening, as Paul doesn’t speak a word of Vietnamese and I know they don’t speak any English. But, everyone is deep in “conversation.” Later I learn they were using drawings to chat with each other. I smile broadly at this odd scene and keep moving. Soon, I near the end, where Becky stands looking at the train timetable and speculating about when we’ll arrive. The boy in the red shorts is nearby, and has been eyeing us the whole trip. He clearly has an intense curiosity about us, but we can’t figure out what it is. Of course, just as this thought crosses my mind once more, he looks at us placidly and says “Hanoi at 5pm.” He then promptly returns to smoking intently in his cheery red shorts. 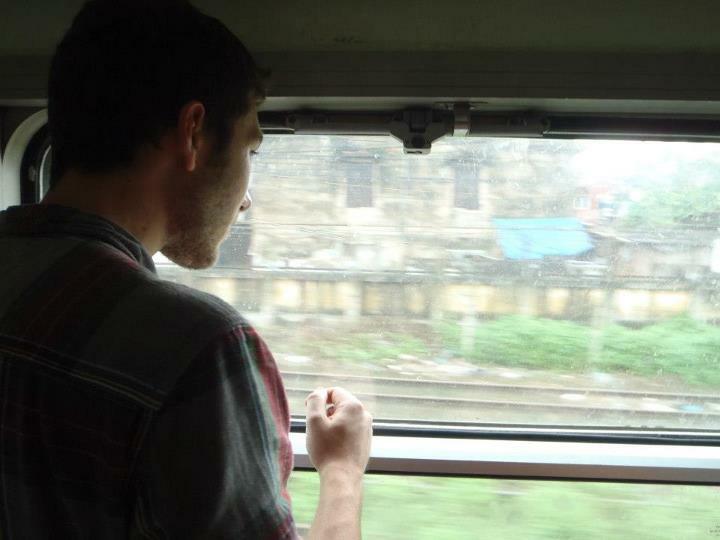 I can’t tell you much more about other things that happened on that 20 hour ride, but I’ll never forget my odd 20 second stroll down the corridor of a train in Vietnam.